While waiting for autumn weather to arrive in Brisbane, I tried to make my outfits a little more autumn-like by wearing longer sleeved tops with my shorts. It's a good option for a day that's not too warm, not too cold. I didn't love both of these outfits the same though, even though they followed the same outfit formula and I carried the same neon pink Rebecca Minkoff mini MAC with them both. After spending a few days in bed unwell, on Friday I felt like getting out of the house. I was lucky to have my mum help me with the boys. It was school holidays so we took them along to one of the free activities at the shopping centre, a dinosaur exhibit. They both loved it! By the end of the day though, I was exhausted and felt I'd pushed myself a little too far - had a cruisy weekend after that! 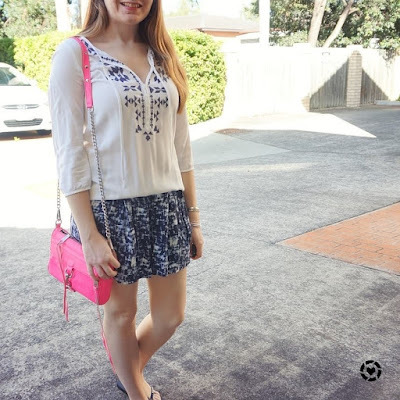 I was so sure I'd worn this embroidered top and the blue soft shorts together before. With them being blue and white, and loving a bit of matchy matchy, I was so sure I'd have already worn them together. I was surprised to look through the blog and find out I hadn't! I really liked the combination. In the cooler morning and air conditioning at the shopping centre, the longer length sleeves were perfect. Of course I couldn't resist adding a little pop of colour, so brought out my neon pink mini MAC bag again. It's been a little while between wears, so it was definitely overdue a wear. Last worn: embroidered blouse, blue printed shorts, Havaianas, Rebecca Minkoff neon mini MAC. Other ways to wear: embroidered blouse and maxi skirt, blue printed shorts and star print tee, Rebecca Minkoff neon mini MAC and khaki tank. Following the same outfit formula as the one above, picking a longer sleeved top and pairing it with my soft shorts. I didn't like this outfit as much as the one above. It was a relaxed day with a couple of errands so loose light layers seemed like a good idea in the morning. It was also unfortunately a very hot and humid day, and I was wishing I hadn't gone with such a warm top! It was the last touch of summer before the rain and cooler autumn weather arrived, 32 degrees (90 fahrenheit). I did like the colours of this outfit though - I love grey and pink together, and have started to try wearing olive and pink together too. The neon mini MAC was such a fun splash of colour. And it was a perfectly comfortable outfit for sitting around playing with the boys after we ran all our errands. 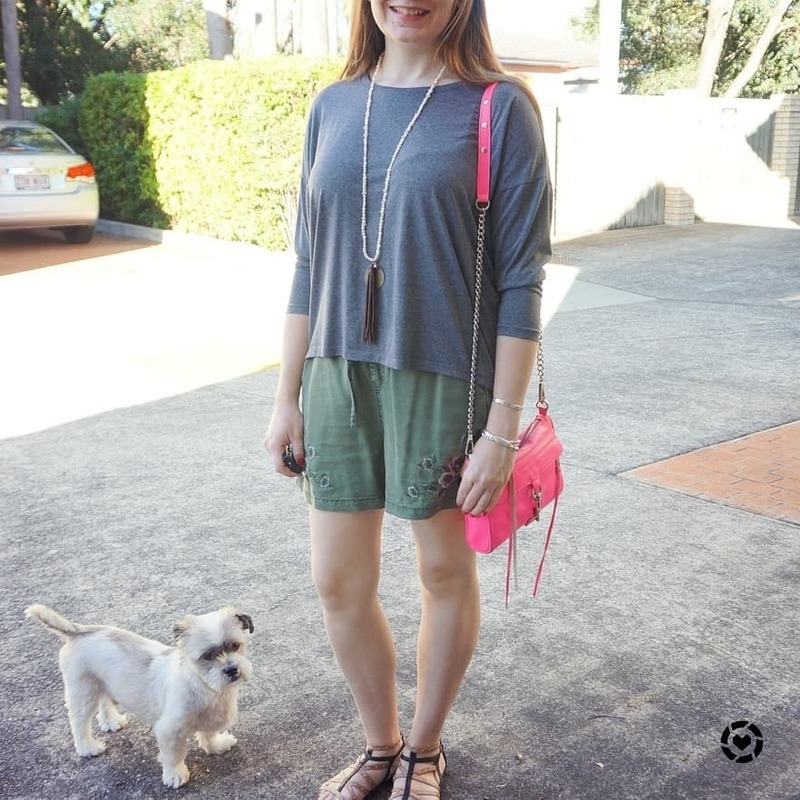 Last worn: grey long sleeve top, olive embroidered shorts, studded sandals, neon mini MAC (above). Other ways to wear: grey long sleeve top and denim shorts, olive embroidered shorts and striped tee, studded sandals and navy dress, neon mini MAC and maxi skirt. Perfect for pregnancy: grey long sleeve top in first trimester, studded sandals in second trimester. Long sleeved tops and shorts work well together in spring or autumn where it's not warm enough to bare arms and legs at the same time. If it does heat up through the day, you can always push or roll the sleeves on your top up too. Linking up with Fun Fashion, Fabulous Friday, Weekend Wear, Flashback Fashion, Friday Faves. Really love the bright pop of pink. I always love wearing sweatshirts with shorts in the fall! Hope you're having a great week! Loving your handbag. I hope you are feeling better. As always, I adore these outfits and their versatility to a whole multitude of situations. My favourite is probably the first one - especially as your nailvarnish matches the bags haha! haha yes, I love when that coincidence happens! Aww, I'm sorry you haven't been feeling well! Glad that you're better now! I love both outfits (as usual). I love a loose outfit in the summer - I feel like most people try to balance out the looseness on both the top and bottom but something about pairing two loose things together works because it's not "supposed" to? (I hope I'm making sense). I love pairing a longer-sleeved top with shorts in the summer- makes for a great mix! These outfits would work for our weather right now--it's been pretty summery but with cooler mornings. How fun when our weather overlaps :) I love the second look, bummer that it was too hot though! I hope you are feeling better now Mica! It is good when the weather overlaps! It's not very common, haha! The mini MAC bags are some of my favorites! I love the color of this one. I love the blue and white combo too! It's crazy it's still so hot there! I'm having a much cooler spring, haha. Hope you are feeling better now! I am feeling much better thanks! :) It is properly autumn now too which is very welcome! I love the pop of pink with both of these outfits, and like you, my favourite is the first outfit. I am not loving that second top on you - like my white Theory top, it's not doing you any favours. You are far too lovely for this top! Toss it! hehe thanks Sheila! I've actually removed it from my wardrobe a couple times but I miss it and pull it back in! It does look better with a more fitted bottom. I wore a long sleeve top today and it was basically summer weather here, yet still not too hot. My autumn wardrobe needs to be wind and rain proof! haha yes, our temperatures are very different! Hope you have a lovely day ahead! Thanks! Pink goes so well with so many things! 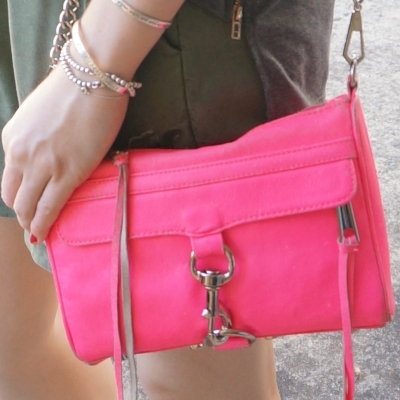 Love the pink neon mini bag! It is so well styled with your mixed navy blue prints. I also Love those olive green shorts. I hope you’re having a good week so far. It is a great bag for running errands! I love a hot pink bag any day!! It is a fun colour to accessorise with! The mini Mac adds such a cute pop of colour to your outfits! And isn't it great when Mum comes to help (ie sanity saver)?! haha yes I'm so lucky to have my mum help so often with the boys! I think a longer top would have tucked in well and looked much better! I really hope you're feeling better, Mica! Sorry to hear you've been unwell, that's never fun. I am however loving your neon pink MAC! How gorgeous is that?! I love the love sleeve on you! Hope you are feeling better! And I love the pink bag. As always love reading your fashion advice!! Thanks Deb, I'm feeling much better! Dear Mica, so sorry you felt not well and you even had to stay in your bed and that this Friday was in the end too exhausting for you. But I love your look, not only because I often wear shorts with a long sleeve (I think even in summer here in Bavaria it is not as hot as in your falls :)). Also the second look is cool! Take care! Thanks Rena! I am feeling much better. Our summers are definitely very warm! sorry you haven't been feeling best lately, but love these outfits! Love the olive shorts especially. 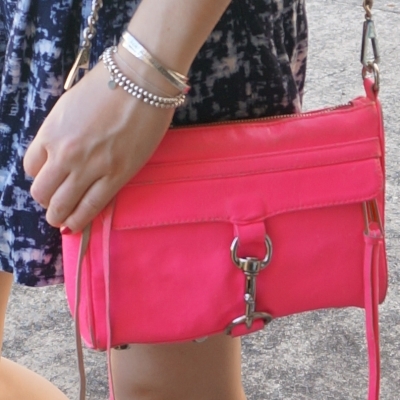 There is that hot pink crossbody bag I love so much! Hope you are feeling better quickly! Both of these outfits are super cute! I always loved the combo of shorts and long sleeves tops. The first outfit is so cute, the light colours and the embroidery print blouse work so well together. The second outfit with its earthly colour is very nice as well. Sorry to hear you were unwell, it's good you had your mother to help you out with the boys. Moms are often life saviours! Yes, I'm so grateful for my mum! Such a great bag! The pop of colour goes so well with both outfits and with many others. Did you try wearing it with red yet? I'm sure it would look amazing with the right red tone and it is so in fashion at the moment as well. I love wearing long sleeves with either a short skirt or shorts as I usually get colder quicker on my arms for some reason. Happy Friday sweetie. It would look great with red, but I haven't worn it that way yet! So sorry to hear you weren't feeling well. So nice your mom was around to help you with the boys. I really like your first look - those two items are such a great match! The soft shorts are really cute and I like they look similar to a skirt. I have always enjoyed pink and grey together, and am recently trying more olive and pink. Hope you have been having a great week!